Bladder cancer is an uncontrolled, rapid growth of abnormal cells in the bladder. The disease usually begins in the lining of the bladder; however, cancerous cells may spread into the muscular wall of the bladder. Invasive bladder cancer may spread to nearby or distant lymph nodes, other areas of the urinary system, organs in the pelvis, or other organs in the body, such as the liver and lungs. The most common sign of bladder cancer is painless, but visible blood in the urine (hematuria). Though, not all blood in urine means bladder cancer is present. You need to see a urologist to be sure. If you experience any of these symptoms, contact your doctor. There’s a high likelihood that they are symptoms of a less severe bladder condition than cancer. But don’t ignore them. You need a healthcare professional to identify the cause to know whether you should see a urologist or not. Don’t ignore symptoms. Only a healthcare professional can advise you whether to see a urologist or not. Early detection is key to increasing survival rates. All bladder cancer is not the same. Bladder cancer can differ in type, size, shape and depth. 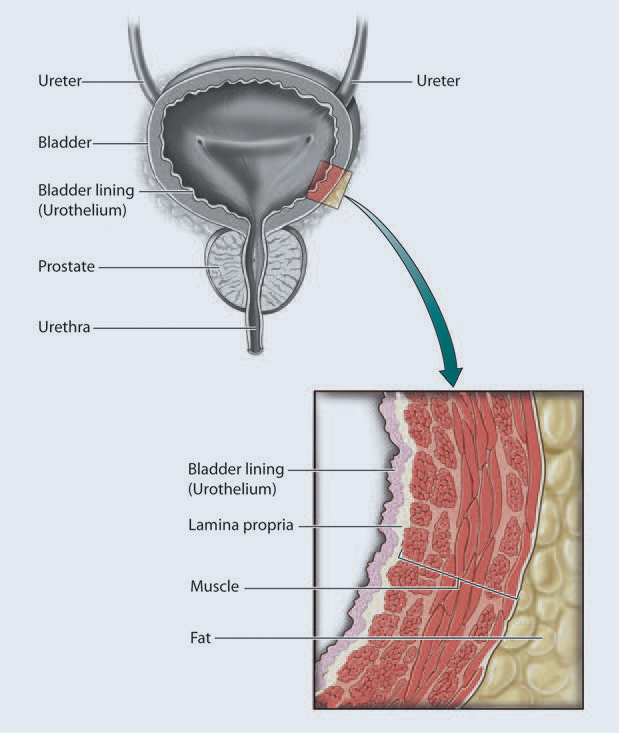 Urologists use a stage and grade classification system to identify and distinguish the different kinds of bladder cancer. This information also helps the doctor decide the best treatment options for bladder cancer patients. The stage is determined by how far the cancer has gone into the bladder wall and if any has spread to nearby tissues and/or other organs. The grade depends on how the cancer cells look under a microscope compared to healthy cells. The difference in appearance helps doctors predict how likely the tumor is to return (recurrence) or continue to grow and spread (progression). Grade is expressed as a number between 1 (low) and 3 (high, i.e. G3); the higher the number the less the tumor resembles a normal cell. Your doctor may refer to the tumor simply as low-grade or high-grade. Non-muscle invasive bladder cancer (NMIBC) is in the inner layer of cells and has not gone deeper. These cancers are the most common (70% of all bladder cancer cases) and include the subtypes Ta, carcinoma in situ (CIS) and T1 lesions. Muscle invasive bladder cancer is when the cancer has penetrated deeper layers of the bladder wall. These cancers are harder to treat and are more likely to spread to other organs. These cancers include the subtypes T2, T3 and T4. Reproduced from Nature Reviews Disease Primers. 2017; Sanli O, Dobruch J, Knowles M.A, Burger M, Alemozaffar M, Nielsen M.E, Lotan Y. To diagnose bladder cancer based on urinary symptoms, physicians will compile a medical history and perform urine tests and cultures to check for the presence of blood, infection and other abnormal cells. If tests show suspicious or positive bladder cancer findings, a urologist will perform a cystoscopy to look directly into a patient’s bladder. This initial cystoscopy may be performed in the doctor’s office or in a clinic where the patient is awake with moderate sedation and/or pain management; or it may be done in the operating room (OR) where the patient is asleep under anesthesia. If done outside an OR and suspicious lesions are found, the patient will then be referred for a cystoscopy in an OR. Regardless of whether the OR procedure is the initial or subsequent cystoscopy, it is in the OR under general anesthesia that suspicious tissue will be removed for further testing. The removed tissue is sent to the lab to be biopsied for histological confirmation and final diagnosis, which includes the disease’s stage and grade. CT urogram scan or MRI to determine if the cancer has spread to the lymph nodes, lungs, liver or other abdominal organs. Chest X-ray to determine if the cancer has spread to the lungs. Bone scan to determine if the cancer has spread to the bones. An intravenous pyelogram (IVP), also called an intravenous urogram (IVU) to detect urinary tract tumors. For non-muscle invasive bladder cancer, the surgery performed is called a transurethral resection of the bladder tumor (TURBT). The urologist performs the TURBT through a cystoscope that either illuminates inside the bladder with white light alone or also has the ability to shine blue light as well. With the availability of blue light, the procedure becomes a Blue Light Cystoscopy with Cysview®. Cysview causes bladder cancer to glow bright pink under blue light. Cysview is the only FDA-approved product on the market for the improved detection of bladder cancer using blue light technology. For muscle invasive bladder cancer, the urologist usually performs a procedure called a cystectomy, which means bladder removal. There are different types of bladder removal surgeries depending on the extent of the disease and if a new bladder can be created from GI tract tissue. Chemotherapy destroys cancer cells using medicines (may be given before or after surgery). Immunotherapy causes the body’s natural defenses – the immune system – to attack bladder cancer cells. Radiation therapy destroys cancer cells using high-dose X-rays or other high-energy rays; may be given before or after surgery and may be given at the same time as chemotherapy. 1 American Cancer Society. Bladder Cancer. PDF Source. Accessed March 2019. 2 Bladder Cancer Advocacy Network. What is Bladder Cancer? BCAN.org. Accessed March 2019. 3 American Cancer Society. Signs and Symptoms of Bladder Cancer. Cancer.org. Accessed March 2019. 4 Bladder Cancer Advocacy Network. Signs and Risk Factors. BCAN.org. Accessed March 2019. 5 National Cancer Institute. SEER Stat Facts: Bladder Cancer 2017. seer.cancer.gov. Accessed March 2019. 6 American Cancer Society. Key Statistics for Bladder Cancer. Cancer.org. Accessed March 2019. 7 Bladder Cancer Advocacy Network. Types, Stages & Grades. BCAN.org. Accessed March 2019. 8 American Cancer Society. Tests for Bladder Cancer. Cancer.org. Accessed March 2019. 9 American Cancer Society. Treating Bladder Cancer. PDF Source. Accessed March 2019.